America’s policy toward Cuba is changing, and no one is sure how or if this thawing of relations will affect our ability to get stamps from Cuba. But today, you have a chance to get genuine stamps of the “old Cuba” that were illegal to own in the United States for 40 years. Recall the history of this communist country with 130 stamps for just $5. 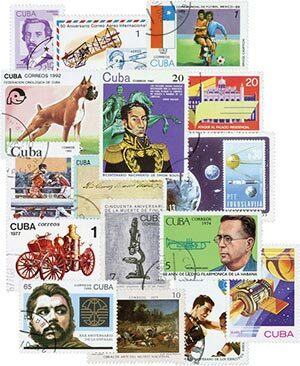 From 1962 to 2001, the U.S. enforced a ban on all Cuban goods, including postage stamps. As collectors, we’ve been unable to purchase and document one of our closest neighbor’s postal history. Today the U.S. Treasury Department is allowing Mystic to import and sell canceled Cuba postage stamps. Due to their educational value, these once-forbidden canceled Cuba stamps can now be yours – mint Cuba stamps are still embargoed. Cuban history is closely tied to ours. Ever since Fidel Castro took power on January 1, 1959, U.S.-Cuban relations have been tense. The Bay of Pigs Invasion in 1961 and the Cuban Missile Crisis of 1962 are two major events in modern U.S. history that resulted in the trade embargo that continues today. Who knows what the future holds for U.S.-Cuban policies? No matter what the result of recent developments, it’s an exciting time to collect Cuba stamps. Now you can add this important history to your growing stamp collection and save $30 or more. Act now, quantities are limited.